Amaranthus hybridus. © Peter Greenwood .www.arkive.org. (Accessed 3/2014). 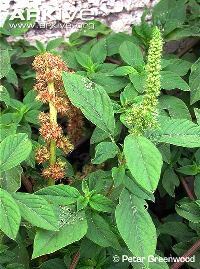 Amaranthus hybridus is an annual C4 herb (Costea and Tardif 2003), to 2 m tall, from a reddish taproot; stems branching, finely wooly-hairy above, often pinkish or red (especially if stressed), generally smoother and darker than A. retroflexus. Leaves alternate, stalk elongate, egg-shaped to rhombic, 5-15 cm long, tip blunt to acute, pale green to purplish below. Flowers dull green to reddish, male and female separate in same inflorescence, (no petals) sepals 5, 0.1-0.2 cm about equal to fruit, tip pointed, surrounded by bracts 0.3-0.4 cm, sharp-tipped, longer than flower, densely crowded; inflorescence of bristly spikes often nodding at tip. Habitat: Weed of open areas, on bare soil, fill. Notes: Used a a vegetable in Tropical America and Africa. Ground seeds used in cereals in North America. Plants preyed upon by a number of nematodes and fungi and numerous insects (Costea et al. 2004).